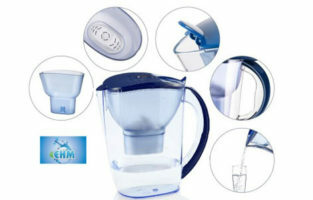 Opt for one of the more affordable but at the same time very convenient water filter pitchers on the market today. 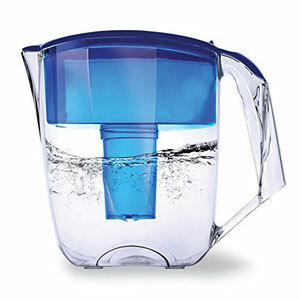 See what the Ecosoft 10 Cup Water Filter Pitcher will have to offer. 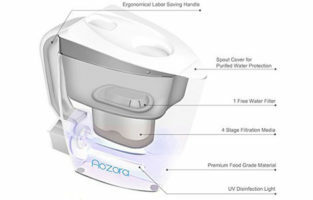 The unit features a complete design which displays well-thought-out details for your pleasant water drinking experience. Even though the jug is a little bit bulkier than expected and won’t fit in your fridge door, it still has outstanding characteristics. 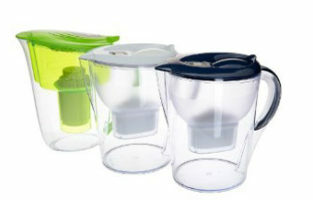 The lid is pretty tight and you will not struggle to keep it closed when pouring. 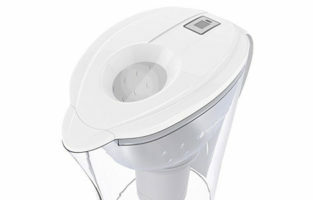 There is a very convenient flip installed on top which allows for quick refills. The only knock in this area is on the actual water reservoir. 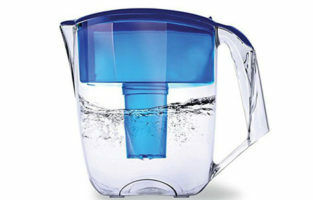 It doesn’t reach all the way up to the lid and when you pour water, you run the risk of having an unfiltered waterfall down to the “clean” compartment. If you do not fill the unit all the way to the edge, though, this won’t happen. 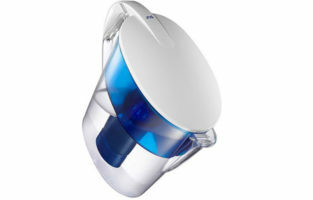 The bottom is also a very reliable part of the Ecosoft 10 Cup Water Filter Pitcher. 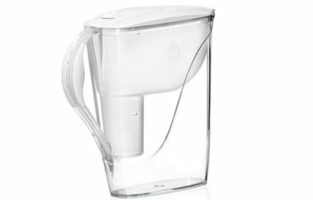 The base is covered with non-slip rubber which provides extra stability regardless of the surface you have your jug sitting. The handle isn’t the best as it is not curved but has smooth edges making it a little uncomfortable to grip. The lid also extends all the way over the spout. 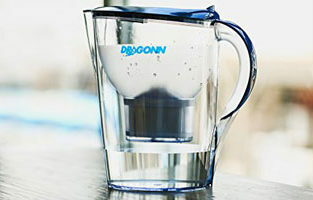 The small cap is a rather important addition as it serves a fine purpose to the water filter pitcher. As the spout is covered, this prevents all sorts of dust and other harmful particles from entering the already filtered water. It will also stop all odors from your fridge from infiltrating the jug. 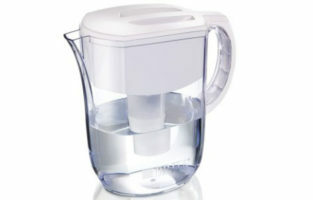 The whole body of the pitcher is very sturdy. 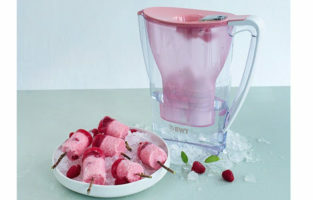 While it is made out of BPA free plastic, it isn’t so easy to crack. In fact, you can even give it a go in the washing machine. The manufacturer doesn’t advise for this to be done but the jug proofs to be more than durable. There isn’t anything too special about the filter as it simply does a good job. 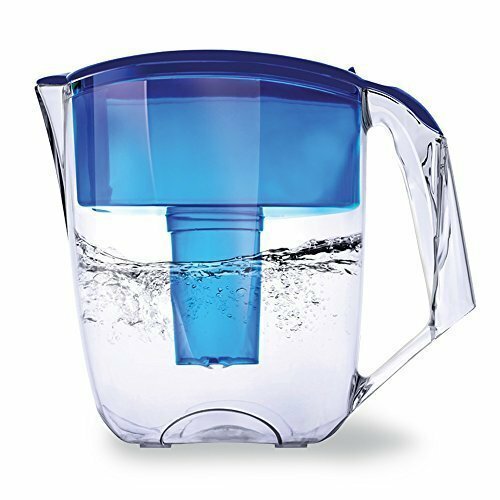 There are a couple of trade-offs when it comes to the filtration system of the Ecosoft 10 Cup Water Filter Pitcher but you are still getting a very decent bargain. So don’t expect it to alkalinize your water. The pH levels will remain the same. What you get is another valuable property. The filter removes fluoride which is definitely a bigger deal. 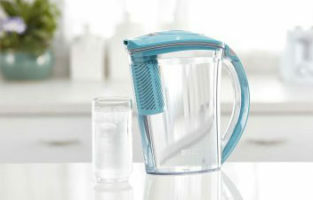 This characteristic alone is often the main reason why people buy this pitcher. 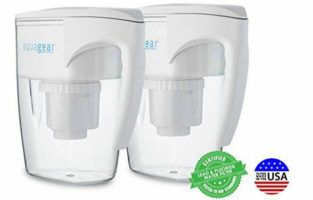 Typically, more expensive units purify water from fluoride but now you can take advantage of this great deal. Check out our buying guide before making a buying decision. The filter needs a few minutes to filter the water. Usually, this number is 5. It will wear out after about 30 gallons of water. It is best if you change the filter monthly. Look for a deal allowing you to buy 2 or 3 at the same time. On the downside, you cannot track the life of the filter and will have to do it using a calendar. 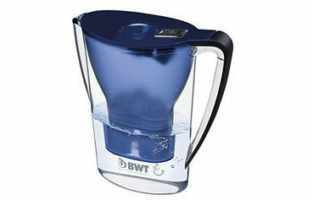 In emergency situations, however, even a Brita filter can be temporarily used as a replacement. The filters are imported and they are made in Ukraine. This is often looked at as an advantage because nothing is crafted in China. 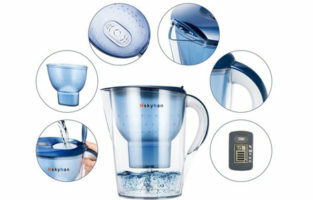 Going for this water filter pitcher, you can also choose from 5 colors. There’s even a black unit which is sort of a rarity when it comes to such products. 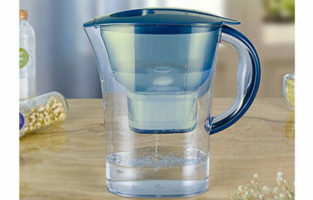 There is a great article explains why you should protect your drinking water from the lead.